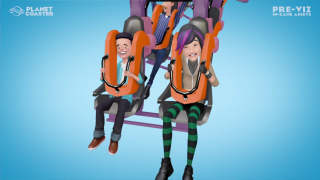 Frontier announced Planet Coaster back in June, but we haven't heard much about it since then. But worry not: this new trailer is only part one of the dev diary, so I'm sure we'll hear plenty more. This first video is about how your theme park visitors in Planet Coaster are treated as individuals, specifically individuals you want to bankrupt. The video actually goes into some technical details on how that's achieved, for instance the way the crowds move through your park and how the developers have avoided having people walk through each other. And how do you manage the audio to give the impression of a crowd without overwhelming the player? We don't know when Planet Coaster will be available, but the preorders say it'll be some time next year.